I was originally going to start this post with a bunch of whining about how things are still sneaking up on me. But I realized I did something similar last year, and probably continued it throughout the year. So I'm going to try to do things a little differently and not do that :). As soon as I saw this recipe and its image pop up in Google Reader I knew that it was something I had to bake, and quick. Even though I had no idea what a sharlotka was (quite frankly I still don't) the image told me all I needed to know. It just looked and sounded too good to be true. Mountains of apples held together with the most basic cake structure. Truly the "cake" portion of this recipe is the baking equivalent of spackle. As I said, I wanted to bake this right away and on my first trip to the grocery store after seeing the recipe, I found a pack of six apples in the "expired" produce section. Six apples for a buck-fifty? It was kismet. But my ambition couldn't keep up with my laziness and I didn't end up using them until a few weeks later (same weekend as the honey cookies). Since the amount of people available was limited, I decided to halve the recipe, though I'm sure no one would have complained if I hadn't. Okay, so the real reason might have been that I had already eaten half of the necessary apples (I love Granny Smiths). As a result, I was forced, once more, to make the decision to use one egg, a half egg, or two full eggs (I've got to start choosing different recipes :)). Not wanting to bother with the half egg, I went with two whole eggs, figuring that more would be better since it had to structurally hold the apples together. I also decided to reduce the sugar a bit and make the switch to brown (apples must have brown sugar :)). Really I only reduced the sugar because brown sugar is sweeter than white sugar, I'm sure the full amount would have been fine. Finally, I felt that a little more spice was needed. Cinnamon dusted over the top is good, but I wanted the spice to be incorporated with the apples themselves. Besides, the glaring omission from the recipe is obviously nutmeg :). It's probably not traditional, so it's a good thing I'm not Russian. This is one of those great recipes that you can whip up with little to no effort and time. The most difficult part is slicing the apples. Other than that, it's pretty much dump in the pan and bake. My batter didn't turn out nearly as thick as I think it was supposed to. No doubt due to the extra egg and the reduced sugar, but it baked up fine. And as with most recipes involving apples, cinnamon, and nutmeg; the smell wafting out of the kitchen was like a warm blanket. It's really difficult to not risk burning your tongue in an attempt to eat it as soon as it comes out of the oven. I think the only reason I managed restraint was that I was too busy stuffing my face with cookies :). If you love apples, you're really going to enjoy this one. It's not quite cake, it's not quite a pie filling. 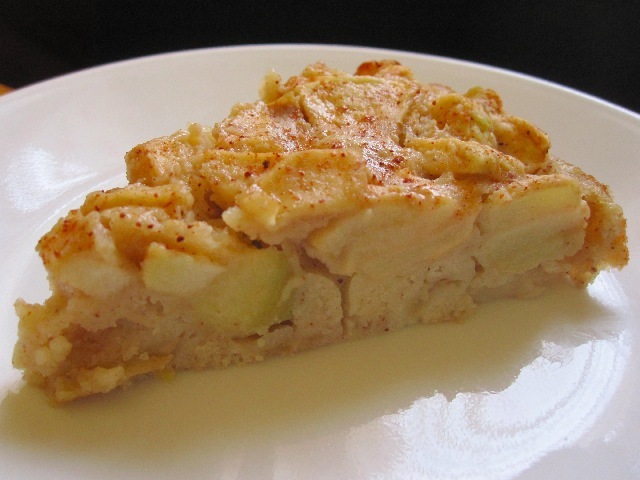 The apples retain some of their crispiness so the cake has a wonderful crisp texture but with a soft creaminess when combined with the cake portion. Both the spices and sweetness were mild, with most of the sweet coming from the apples. As I mentioned earlier, you may or may not want to increase the amount of sugar. 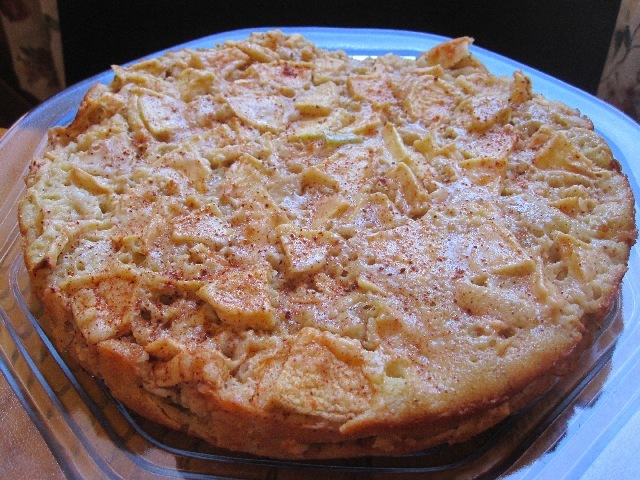 Although should you eat the cake warm the apples are much sweeter, but you're going to lose some of the crispness. Everyone really seemed to enjoy it, though I do think something was missing. Perhaps it's because the batter was a little "watered" down because of the egg and sugar; but I think a bit of salt would have really enhanced the flavour. And maybe I'm just completely wrong and all you need is a dusting of powdered sugar on top, something which I discovered my mother doesn't have on hand anymore. Apparently, she still hasn't recovered from the shock of losing all of "her" baking products when I moved out. And also mentioned that I had thrown out the stuff that she did have. You know, things like ten year old condensed milk :). But if you don't have powdered sugar (and you don't find out too late), dusting the top with cinnamon sugar rather than just cinnamon would be a terrific substitute. This recipe is one that would be awesome with breakfast or after dinner; with coffee or tea. It will satiate your desire for apple cake and/or apple pie. It's quick and easy, and makes everything smell awesome. What I'm saying is that there are very few reasons to not bake this. Unless you end up eating all your apples first, in which case, I suggest you go out and get some more apples :). Preheat oven to 350F and grease an 8" round cake pan, line the bottom with parchment paper and grease parchment paper. Core and quarter apples. Slice each quarter in half. Then slice apples width wise into half inch pieces. Add apples, cinnamon and nutmeg to a large bowl and mix together until apples are coated with spices. In a medium bowl and with a whisk beat together eggs and sugar. Add vanilla and mix until completely combined. Add flour and stir with a spoon until combined. Pour batter evenly over apples. Shake and tap pan to distribute batter through all the apples, and then smooth out the batter on top. You should have a relatively even layer of apples and batter. Bake for 25 to 30 minutes (mine took 30) or until toothpick comes out of batter cleanly and apples can be easily pierced. Allow to cool in pan on rack for 10 minutes. Remove from pan and allow to cool bottom side down. Dust with cinnamon. Eat warm or at room temperature. Dust with powdered sugar before serving. Every now and then I recall eating wonderful apple pies as a child that didn't have the traditional thick 'gooey' apple pie filling, but just tasted like wonderful, intact baked apples. This easy dessert looks like it would be the perfect way to experience that again! I love your discovery and had never heard of a Sharlokta before and will put this on 'my list.' As for the 'needing something,' though--I know that most apple pie recipes I've read (though there are SO many) call for a mix of different kinds of apples. I know you like Granny Smith, but perhaps using a blend of apples (sweet as well as tart) might solve the problem of the dessert 'needing something.' I might give it a try with some Empires or Fujis added in. @Mary -- I typically make my apple desserts with just granny smiths, though I have used golden delicious/granny smith combos before. However, this is the first time that I ever really felt something was missing (and this recipe is similar in a lot of ways to the Naked Apple Pie I made a little while ago). Switching out the apples will definitely change the flavour profile so I'd be interested to know should you try it. @Gloria -- It is rather healthy, isn't it? Now that I think about it, next time I might just make the entire thing :) (provided I don't eat all the apples first).